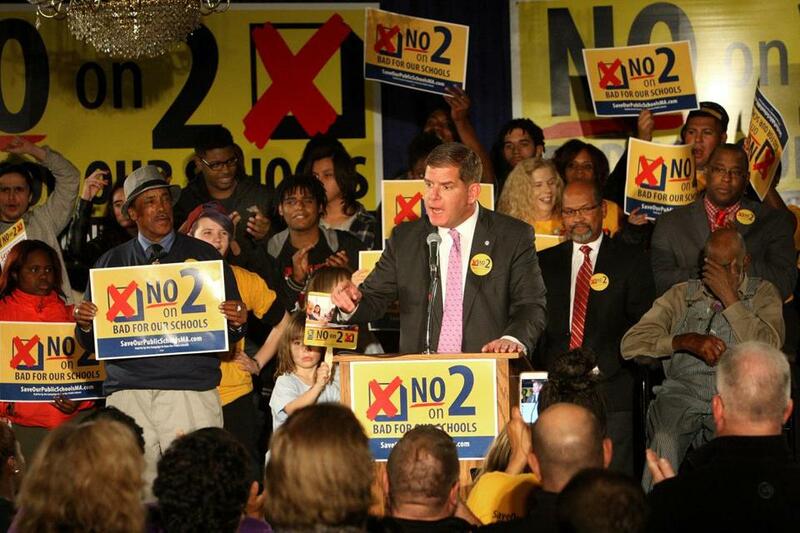 Mayor Martin J. Walsh spoke Nov. 1 during a “Vote No on Question 2” rally in Dorchester. THE PEOPLE IGNORED the elites and defeated Question 2, the campaign to expand charter schools in Massachusetts. Now it’s time for Governor Charlie Baker and the charter school industrial/media complex to stop lecturing the people and start listening to them. The bid to lift the cap on charter schools in Massachusetts was crushed, 62-38 percent. The measure lost everywhere, including in those cities where proponents insist charters represent the only path to better education for students of color. Voters — who include parents of those students — disagreed. Just like Donald Trump supporters, anti-charter voters dismissed the political and media powerbrokers who told them they know what’s best for them. But Question 2 opponents say the opposite is true: “What we found is most every voter we spoke to was connected to public schools — they went to public schools, sent their kids to public schools, or were grandparents of children in public schools,” said Lynda Tocci, the veteran Democratic strategist who directed the “No on 2” campaign. In neighborhoods that have among the lowest-achieving schools in the state, opposition to the ballot question ran deep. Actually, charter school backers — at least those who poured $24.2 million into “Great Schools Massachusetts,” the pro-Question 2 campaign — are the ones who didn’t have a personal stake in the outcome. Most of that funding came from out of state, from contributors like former New York mayor Michael Bloomberg, Walmart heirs Jim and Alice Walton, and a plethora of euphemistically named nonprofits that aren’t required to identify their donors. Voters didn’t share the view from Swampscott. There was deep opposition to Question 2, even in neighborhoods that have some of the lowest-achieving schools. In Boston, for example, the ballot question passed in only 14 of the city’s 255 precincts. Support was mostly concentrated “in a largely white swath of the city that extends from the West End through Beacon Hill and the Back Bay,” wrote the Globe’s James Vaznis. If Baker and charter school zealots start listening to Question 2 opponents, instead of to each other, this is what they would hear: They want strong public schools for everyone, not a system that in their view benefits some but not all students. They don’t see teachers, or the unions that represent them, as the enemy. They see them as partners in a venture that requires total commitment from the top down. Charter proponents insist their schools don’t divert money from traditional public schools. But parents and teachers in traditional schools know they are not being fully reimbursed as the law requires; doing that is a minimum for any buy-in to more charters. If Baker cares about the quality of public education in Massachusetts as much as he says he does, he should stop writing off all charter skeptics as antireform union organizers. The opposition runs deeper than that. It comes from people who are sick of being told they are too stupid to know what’s good for them.